Festivals are among the many things that attract tourists to come to Japan. From simple cherry blossom viewing events to peculiar traditional ceremonies, foreigners will have a hard time going through the long list of activities to participate in throughout their stay in the country. For the right amount of fun and culture, tourists planning to take a trip during the months of July, August, or September should make it a point to visit at least one Obon or Bon Odori Festival. Obon, or simply referred to as Bon, is a Buddhist practice that is observed in Japan as a means to honor ancestral or Nisei (second generation) spirits. The custom has been a part of Japanese culture for more than five hundred years and involves different traditions including cleaning ancestral graves and performing dances called bon odoris. The Japanese term Obon serves as a shortened version of the Sanskrit saying Ullambana, which means to hang upside down. In order to amend the negative implications of this saying, the Japanese started to look for ways that could help them avoid this great suffering. Among the different ways the locals did to pay their respects to the spirits, the Bon Odori served as the most effective and most popular. It is based on the folk tale about a Buddhist disciple known as Mokuren (Maha Maudgalyayana) who made use of his supernatural capabilities to find the spirit of his deceased mother. Unfortunately, he found his mother suffering in the world of hungry ghosts and became greatly disturbed by the situation. Looking to release his mother from endless torment, he went to the Buddha and asked what he could do to free her from the said realm. Buddha then instructed Mokuren to give offerings to the monks coming back from their summer retreats on the 15th day of the lunar calendar’s seventh month. After doing so, Mokuren saw his mother’s spirit being free of the hungry ghosts. Overwhelmed by his mother’s release, the Buddhist disciple joyfully danced while reminiscing the kindness and selflessness of his mother. This dance became the basis of Bon Odori, which is performed during the Obon Festival in order to properly remember and appreciate ancestral spirits. Over time, Obon has become a time for families to meet, gather, and celebrate the legacy of their ancestors and pay them proper tribute. The festival typically goes on for three days, but the starting dates vary from region to region due to the shift from the lunar to the Gregorian calendar during the start of the Meiji Period. As such, three Obon times are observed across Japan throughout the year – Shichigatsu Bon (Month of July; Eastern Japan), Hachigatsu Bon (Month of August; Majority of Japan), Kyu Bon (Seventh Month of the Lunar Calendar; Northern Japan). A handful of places also celebrate Obon during the month of September. Although Obon is not officially regarded as a holiday in Japan, it is common practice for companies or government agencies to grant their employees with excused leaves for the week of the festival. Obon festivals typically start on a Friday or Saturday and end on a Sunday. The Bon Odori Dance Festival at the Hibiya Park has been an annual festival of Tokyo since 2003 when it served as the park’s commemorative event for its 100th anniversary. More than 30,000 people visit the park for the two-day event which involves the central fountain being wonderfully illuminated for visitors to dance around at. The Tsukiji Hongwanji Bon Odori for 2017 serves as the 70th summer dance festival of the Tsukiji Hongwanji temple. Some of the things tourists can expect from the event include performances by the Oedo Sukeroku Taiko and Minyo Dance Group, different costumes to keep things lively, and tons of Japanese street food at the nearby Tsukiji Market. The 2017 Bon Odori Dance Festival of Roppongi Hills offers visitors with a massive, elevated stage where everybody can join in and be a part of the different dances. The festival does not follow strict guide lines on how the program should be done and simply requires each participating person to enjoy and have fun according to his own pace or preference. Food stalls offering various street food, snacks, and refreshments are available all throughout the 3-day festival. The 10th Bon Odori Dance Festival is one of the most famous of its kind in Kanagawa, given its location at the port city of Yokohama. A large stage, several stalls, and a lovely day by the sea are just some of the things that attract hundreds and thousands of visitors to the event on an annual basis. At night, visitors can also enjoy a romantic view of the Yokohama Bay Bridge being illuminated. Camp Shimoshizu’s Bon Odori Dance Festival features performances by the Japan Ground Self Defense Force’s music corps, various outdoor stores, and a breathtaking fireworks display, among other activities. 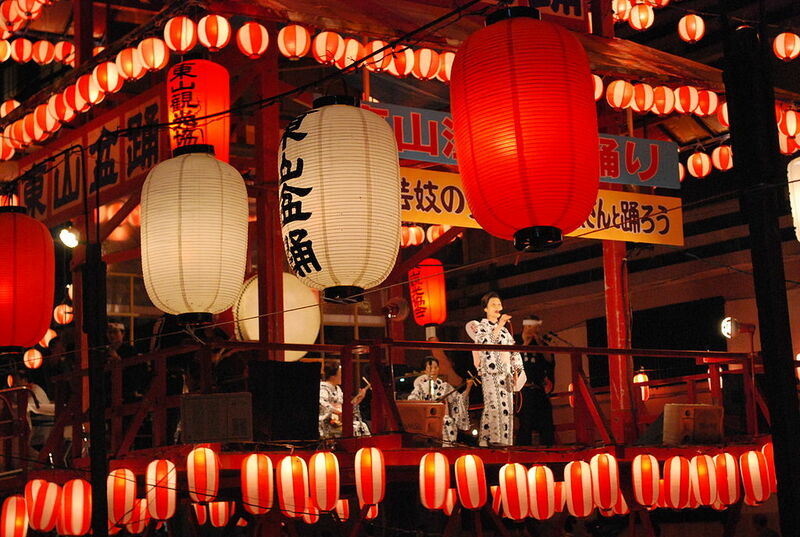 Nearly every region in Japan has its own set of songs and dances for Obon. 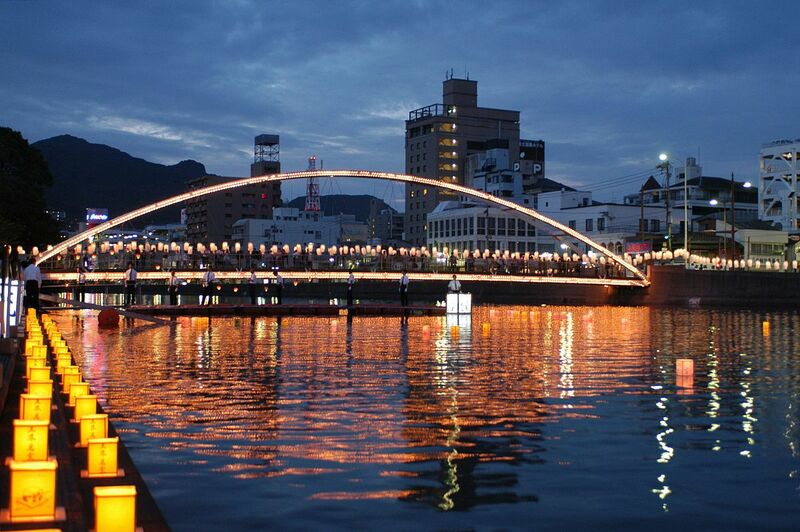 For the Kansai Region, the Kawachi Ondo serves as the most popular, while the Awa Odori for the area of Tokushima. Face the direction that will create a counterclockwise movement when walking forward. After the music starts, count to four. Make a gesture similar to how a coal miner would grab a scoop. Dig twice at the right side. Dig twice at the left side. Act as though a coal miner going out from the mines. Look slightly up as if there was a beautiful moon and hold for two counts. Move similar to how a coal miner would push a lorry. Move similar to how a coal miner would open a gate. Repeat moves 4 to 12 until the song is over. Using the right hand, make a gesture similar to shading one’s eyes from the sun then step back. Using the left hand, make a gesture similar to shading one’s eyes from the sun then step back. Create a circle with both arms while stepping forward with the right foot. Create a circle with both arms while stepping forward with the left foot. Stretch the right arm forward and touch the right elbow using the left hand, all the while stepping forward with the right foot. Stretch the left arm forward and touch the left elbow using the right hand, all the while stepping forward with the left foot. Using the right hand, make a gesture similar to shading one’s eyes from the sun then step forward. Using the left hand, make a gesture similar to shading one’s eyes from the sun then step forward. Face the center of the group circle. After the music starts, count to eight. Clap five times, making sure to turn right during the last clap. Step forward with the right foot while bringing up the hands together in front of the face to form a mountain shape. Step forward with the left foot while separating the hands from each other and drawing them to either side. Step forward with the right foot while covering the face with the right hand and keeping the left foot off the floor. Step forward with the left foot while covering the face with the left hand and keeping the right foot off the floor. Place the right foot back on the floor while making a circle with both arms. Make a small circle only using the hands. Step back with the right foot then forward again using the same foot. Step forward with the left foot while stretching the left arm forward and covering the face with the right hand. Step forward with the right foot while stretching the right arm forward and covering the face with the left hand. Slightly bend the knees while putting both hands to the side. Place the left foot back on the floor while making a circle with both arms. Step back with the left foot then forward again using the same foot. Turn clockwise using four steps while making a gesture similar to sweeping one’s face with both hands. Face the center of the group circle and step forward with the right foot while opening both arms forward. Repeat steps 3 to 19 until the song is over. As discussed, Obon festivals typically last for 2-3 days, depending on the region or place hosting it. 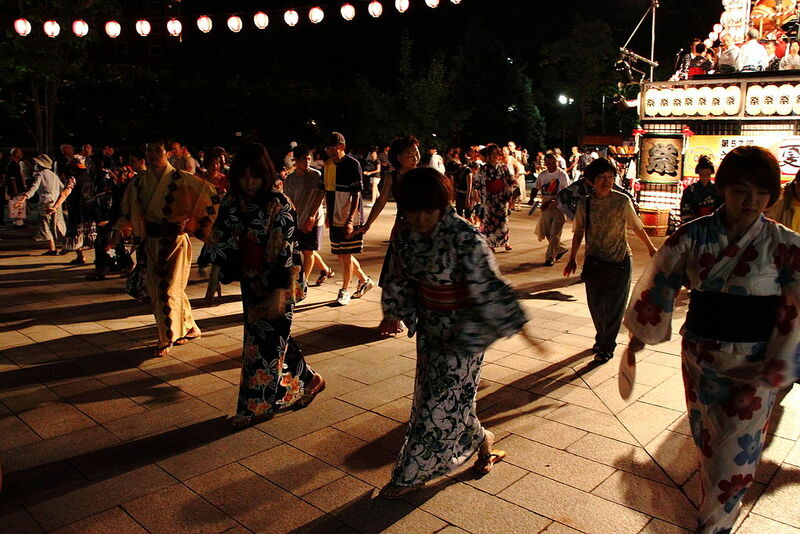 Although the Bon Odori serves as the festival’s most popular activity that a lot of visitors look forward to seeing or participating in, there are other things that can be expected during Obon. Mukaebi is a Japanese term used to refer to “welcome fire”. As implied by its name, it is done during the first day of the festival as a means to welcome the spirits and guide them to their respective homes using lanterns. A lot of households often have an electrified paper lantern or a small fire place outside to let their ancestors know where to go. Homes that feature a lantern placed outside signify that the family has recently lost a loved one and is helping the spirit find its way back to them for the very first time. Some places also take this time to create a massive fire ceremony using natural fuels to collectively welcome all the spirits wandering the area. Ozen refers to the practice of offering refreshments, food, and snacks to the spirits. These offerings can often be found at the Buddhist altar of families and include items such as sake, handmade confectioneries, green tea, rice, and fruit. This practice not only serves as a way of honoring ancestral spirits but also as an attempt to keep their memories alive by sharing a meal with them. Ohakamairi describes the Japanese tradition of visiting and cleaning ancestral graves during Obon. Some households follow a particular ritual to clean the grave stones of their ancestors, while others simply think of the activity as some form of family reunion. 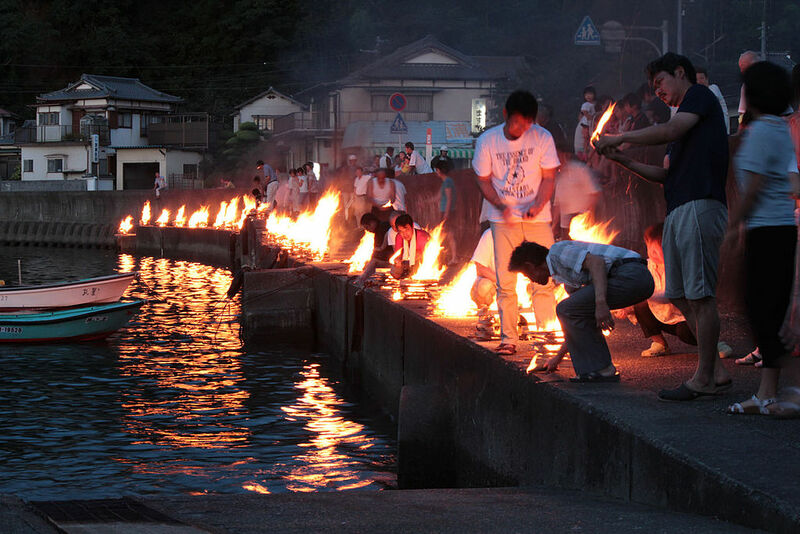 Okuribi and toronagashi are two Japanese terms used to refer to the end of the Obon festival when the spirits are seen off to their realm through a fire ceremony. Festivals which do this near bodies of water, for example, a river or sea, not an onsen (hot spring), often feature lovely lanterns set out by participants, while other festivals feature numerous candles to represent the spirits.